The fjords glow in eye-catching turquoise-blue colours, starkly contrasting with the icebergs and the green farm land. Narsarsuaq was a former American military base, so the town itself is not as charming as other Greenlandic villages with colourful houses. Looking to the horizon, you see how amazingly lush and beautiful the region is. Narsarsuaq is also the gateway airport to South Greenland, with flights coming from Copenhagen, northern Greenland and Iceland. The airport is known locally to have one of the most beautiful air approaches, with flight routes crossing the ice cap to a view of fjords framed by green countryside and sheep farms. There are about 150 inhabitants. Almost everyone works at the airport or the hotel. 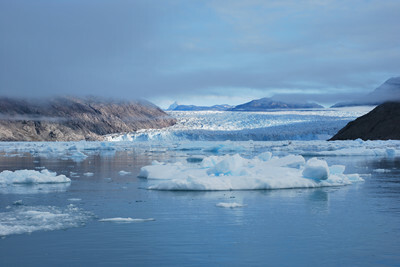 Not far from Narsarsuaq is an ice-filled fjord that leads into Qooroq Fjord. About 15 km at the end of the fjord is the Qooroq Glacier. Qooroq is very active, calving 200 tons of ice per day. The glacier is clearly visible, and it’s clear the origin is the vast ice-cap which covers most of Greenland. The boat engine is turned off so you can enjoy the noisy silence emanating from your glass, as air bubbles escape your 1,000 year old ice cubes while you drink something tasty. The price includes: Sailing and refreshment with ice - more than 1,000 years old! 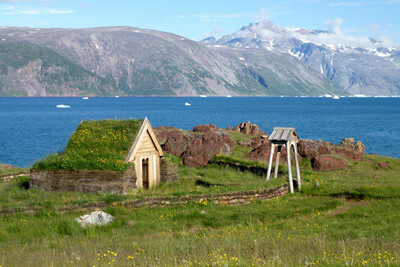 In 2017, 5 regions of South Greenland were recognised by UNESCO as World Heritage Sites, which together form "Kujataa Greenland: Norse and Inuit agriculture at the edge of the ice sheet". Qassiarsuk is part 1. Only 15 minutes by boat from Narsarsuaq - across the other side of the fjord is the settlement, which is also a sheep farm. You’ll find agriculture on the same land which Erik the Red farmed. From Qassiarsuk you can also walk on your own along the tractor track towards the ice-filled Bredefjord. Halfway, you can enjoy the beautiful views over both fjords and a wild landscape spotted with small lakes. It’s a 16 km round trip if you choose to walk all the way down to the sheep farm Tasiusaq.